A fight against unfair pricing, unfair competition and unfair business practices. ZA Domains Founder, Jade Benson documents his fight against the ZA Central Registry (ZACR) on behalf of the Registrar Industry regarding ZACR’s excessive “Proxy Fees” that are imposed on Proxy Registrars, unfair pricing and unfair business practices and how this irresponsible approach to the launch of it’s gTLD’s has negatively affected ZACR’s ability to break into a market dominated by hundreds of other gTLD’s currently available. Despite multiple attempts to increase sales for the dotCities gTLD’s, ZACR has failed to turn it’s dotCities into a success story. It is without doubt that unfair pricing and unfair competition have created a monster within the domain registration and registrar market in which a few privileged and preferred Registrars are given preferential pricing. In addition to this, ZACR’s decision to prevent any further Proxy Registrars from registering their dotCities domains at wholesale from the Registry is restricting competition. These decisions are the primary reason why ZACR currently “boasts” to date 11,018 dotCities domain names registered which ranks it on a global scale of 0.04% amongst it’s competitors such as Uniregistry who administer XYZ domain names. ZA Domains has been at the forefront of the fight to reduce or waiver the Proxy fee in order to allow ZACR to promote fair business, and growth of the dotCities domain names. We hope that all other ZACR Accredited Proxy Registrars will join in on the #ProxyFeesMustFall campaign and persuade ZACR to waiver the 47% additional fee billed to these Registrars. It is important to understand the history of the dotCities gTLD’s, and where 99% of the ZACR Registrar market fits into the equation and how they are negatively affected by the points raised above. P.S., this is a long read, but it details how long ZA Domains has pushed to have ZACR reduce or waiver the dreaded Proxy Fee. ZACR Announces that it will ensure that its Registrars are able to participate on the provisioning of its new gTLD’s – .Joburg, .Capetown and .Durban (herein referred to as dotCities). This decision is vital as it ensures that these new gTLD’s are subject to fair competition which is imperative for any new and existing gTLD to succeed. It has been the ZACR’s stated intention, as early as 2011, to ensure that the existing ZA Registrar community, who serve the bulk of the ZA name space, are also afforded direct access to these important South African city gTLDs (.CapeTown | .Durban | .Joburg). We believe that by opening these new gTLDs to the current ZA Registrar community, we will improve the exposure and access of these exciting new naming opportunities to the broader South African public. ZA Domains actively participates in the Pilot Project to assist ZACR in resolving issues affecting its Proxy EPP Service. ZACR notifies all ZACR Accredited Registrars that they may start the required dotCities Accreditation process in order to complete their Proxy Accreditation, required for provision the new dotCities directly available via ZACR. ZA Domains completes its Proxy Accreditation after development of an automated gTLD Accreditation service. The automated gTLD accreditation provides all Registrars that utilize ZA Domains’ Multi-Registrar platform to facilitate EPP Services into ZACR’s environment to pass the required accreditation for the new gTLD’s and allow them to participate in the provisioning of the new dotCities domain names. Unlike other providers, ZA Domains has constantly ensured that the services available to it’s Registrars are transparent and provide those Registrars with the ability to provision gTLD’s directly via their own ZACR Registrar account as opposed to transparently pushing any sales of these gTLD’s through ZA Domains’ own Registrar Account without the Registrars knowledge or consent. ZA Domains lodges a complaint with ZACR to inform ZACR that it is not correctly displaying a list of Accredited Proxy Registrars on the ZACR Registrar page, but rather only displaying ICANN Accredited Registrars as being able to sell the dotCities domain names. ZACR confirms that Proxy Registrars are not correctly reflected on the ZACR Registrar page and that they are attending to the issue. ZACR Marketing and sales representatives meet with ZA Domains and during such meeting ZA Domains raises the issue of the excessive R40.00 ex vat Proxy fee billed to Proxy Registrars over and above the R90.00 cost of Registration of a dotCities domain name. ICANN accredited Registrars are charged R90.00 ex vat for the registration, transfer or renewal of a dotCities domain whereas Proxy Accredited Registrars are charged R130.00 ex vat for the same registration, transfer or renewal of a dotCities domain name. ZA Domains requests contact details for the person(s) responsible for the pricing of the gTLD’s in order to lodge an official complaint with the Registry as to its excessive and unfair Proxy fees billed to Accredited Proxy Registrars. ZA Domains further advises that it has successfully completed a large number of dotCities gTLD accreditations for the Registrars who utilize the ZA Domains Multi-Registrar Services. ZA Domains requests that ZACR provide an update and ETA on the issues raised on the 18th November in which Proxy Registrars are not reflecting on the ZACR Registrar page. ZA Domains advises ZACR that it has completed the Proxy Accreditation process for 15 additional ZACR Registrars and that as a result of the excessive and unfair proxy fee, all ZACR Proxy Registrars are unable to compete for sales within the dotCities name space. A formal request was lodged with ZACR to investigate and review its R40.00 ex vat proxy feel billed to Accredited Proxy Registrars. ZA Domains requests a meeting with ZACR CEO, Lucky Masilela and ZACR Legal team to discuss the issues repeatedly raised regarding the excessive R40.00 proxy fee. ZACR Suspends any further Proxy Registrar applications without notice. The suspension comes after two South African ICANN Accredited Registrars threaten to lodge complaints with ICANN for ZACR trading as the ZA Central Registry and making use of DN Services PTY LTD’s ICANN account. It is important to note that this decision jeopardizes the potential growth of the dotCities gTLD’s and creates additional unfair competition to ICANN Accredited Registrars who already benefit from favoured pricing for these gTLD’s. ZA Domains meets with ZACR Exco & Marketing to discuss the issues regarding the excessive proxy fee and provide ZACR with advice on the lack of dotCities domain name sales. ZACR announces the launch of its “Winter Sale on .CAPETOWN, .DURBAN & .JOBURG” from the 4th July 2016 till the 8th July 2016. During the Winter sale, ICANN accredited registrars are billed at R45.00 ex vat and Proxy Registrars billed at R85.00 ex vat per dotCities 1st year domain registration. ZA Domains responds to a reminder email about the up and coming winter sale and advises ZACR that most Proxy Registrars will not be able to participate in the sale considering that Proxy Registrars are charged 47% more than that of their competitors for dotCities Registrations. ZACR CEO requests a meeting with ZA Domains to discuss the excessive proxy fee, lack of dotCities sales and marketing strategies to assist in boosting sales for the dotCities domain names. ZACR CEO Lucky Masilela confirms that the excessive proxy pricing schedule has been put forward to the ZACR board for review, and that an official response will be published as soon as reviewed and agreed upon by all ZACR board members. ZA Domains founder Jade Benson is invited to be part of a panel discussion at iWeek 2016 in which the top 5 South African Registrars would discuss and debate the future of ZACR and delegation of it’s new .ZA Domains. During the panel discussion Mr Benson again requested that Mr Masilela review the excessive Proxy fee’s and was reassured that relief and review of the fees would be announced soon. ZACR announces the Summer in your City Sale which starts on the 7th November 2016 and ends on the 7th January 2017. During the Summer in your city sale, Proxy Registrars are billed an additional 47% more than that of their competitors. 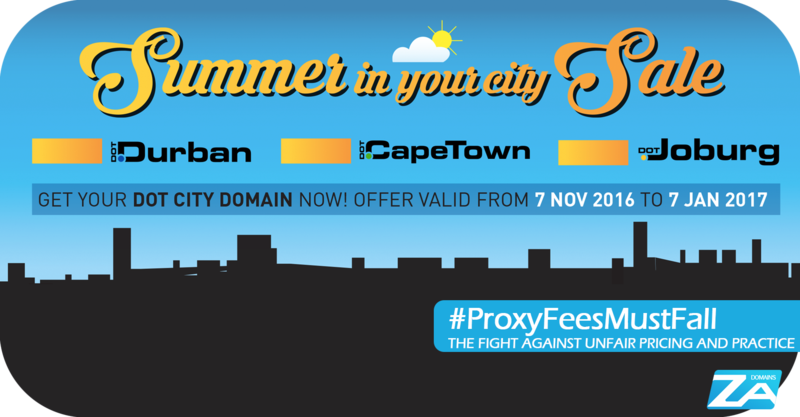 In response to the Summer in your city email, ZA Domains questions ZACR CEO and Marketing Dept as to how any of the Proxy Registrars benefit from this and other sales when three South African ICANN accredited registrars are billed 47% less than Proxy Registrars. Furthermore we highlight that in order for growth to occur within the dotCities gTLD’s fair pricing is required for all South African Registrars. In response to questions directed at ZACR EXCO regarding the lack of review of the excessive proxy fees, ZACR CEO Mr Lucky Masilela advised that the ZACR board was still to be briefed on the matter and that once done so, updates would be provided. Mr Masilela is questioned as to why the board had not been briefed regarding this matter considering that this had been an ongoing issue, and despite this Mr Masilela had previously stated that the ZACR board had already been briefed regarding the excessive proxy fee and that his response was conflicting to previous statements. ZACR publishes the Summer in your city sale via Creamer Media news site in which it advertisers to consumers that a dotCities domain name registration will cost the same as a Co.Za Domain Name Registration. ZA Domains notifies ZACR via email of its disappointment with ZACR’s publications and that it has been wreckless and irresponsible with its suggestions via publication that consumers / resellers can purchase dotCities domain names at the same price of a Co.Za during the special when ZACR is well aware of the 47% additional fee billed to Proxy Registrars.